Ruby – hip dysplasia. 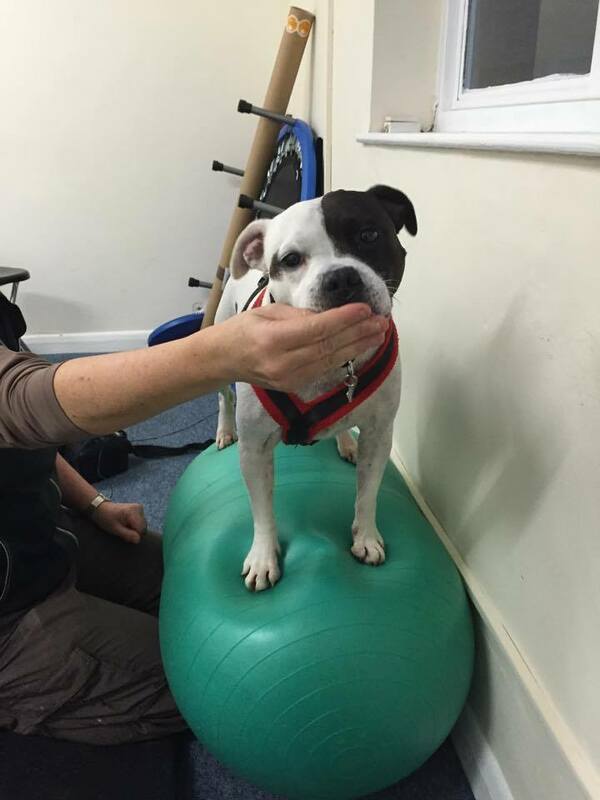 Ruby absolutely loves her physiotherapy sessions for her hip dysplasia with Nycky. 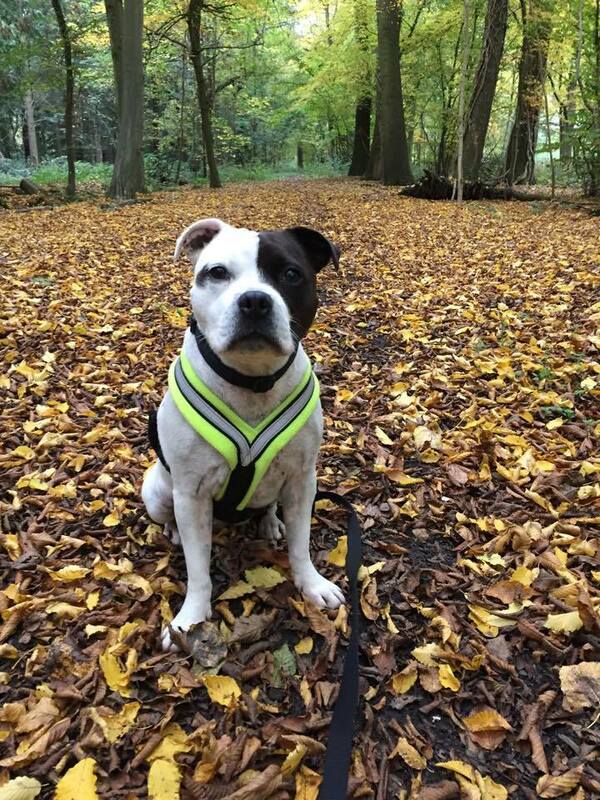 Ruby can be nervous of handling but Nyckys natural ability and charm with dogs has ensured that Ruby will cooperate happily and allow a full assessment and treatment to be completed. We find the sessions very reassuring and Nycky is full of information and advice that allows Ruby to live a full life without us worrying constantly about her condition. Without this guidance and monitoring we would have limited Ruby’s exercise and play much more than we needed to. 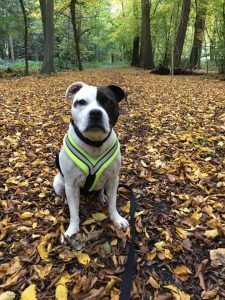 By following the advice given we understand how to help Ruby in between appointments and we know that should we be worried about absolutely anything we can call Nycky and she will help us. Pip – post op CCL repair. Pip is a great character and an energetic chap who lets everyone know when there are visitors by running to the door. 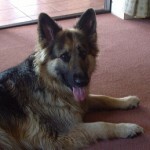 He had to have an operation on his knee after his cruciate ligament ruptured. His physio rehabilitation started with ten days of his operation. His owners for very diligent at doing his fun but therapeutic homework to help him use the leg correctly which is the best way to get it to strengthen up again and not put strain on the other leg. Nycky was recommended by my instructor. I particularly like how Nycky asks to see the horse in all 3 gaits and asks about recent work and competitions. She gives me a copy of notes on what she has found and treated so we can both look back to see what is changing. The exercises she gives are comprehensive. 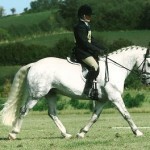 I try have physio every 6 weeks for my horse and recommend Nycky. from Wes. 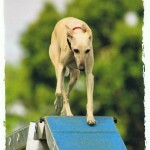 Popp y a young whippet who loves and is very quick at agility had to have an operation to correct her luxating patella. Her owner assumed she would not be able to do agility again but with excellent physiotherapy rehabilitation from soon after the operation right through to Poppy returning to agility training, Poppy has returned to the sport she loves. 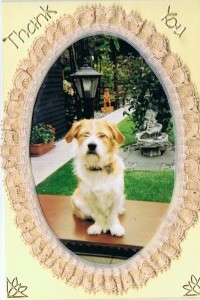 Her owner Karen sent this lovely thank you card with a photo of Poppy at agility. Bessie had an FCE which is a stroke in the spinal cord which left her paralysed in all 4 limbs. She came home to lovely attentive owners who had to help her to move into a different position every 2 hours so that she did not get pressure sores or sore muscles. 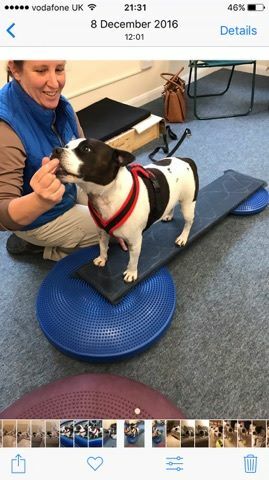 I showed the owners how to best assist Bessie to move so that it was comfortable for her, protected their backs and provided therapy to promote healing at the same time. As Bessie recovered she learnt to sit, stand and walk again with the help of regular physiotherapy. 6 months later she is able to get on with her life with only her one front leg not working properly and a little wobbly in her back legs. 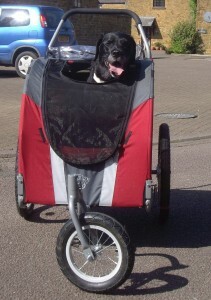 To help her go for longer outings her owners have bought her a doggy disability buggy which means she goes in that to the park then gets out and plays with her friends and meets people until she is tired and then gets taken home. She is a very happy 10yr old Labrador. Squeak had to have an operation after a disc in her spine pressed on her spinal cord and caused her to be paralysed in her hind legs. She has had physiotherapy and hydrotherapy to help her to walk again. She can now walk and run al be it with a little wobble from her right hind leg. 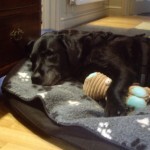 Tilly – 6 yr old energetic Lab – post CCL repair physio rehab. Tilly h ad an operation to repair her ligament in her hind leg and her vet recommended post-op physiotherapy from a week after the operation. She is an energetic lady and her home had tiled and wooden floors which are a risk of slipping which would cause the repair to break. 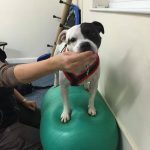 Her owner, Peter said that he was happy she received physiotherapy and that the good range of therapies to benefitted her as well as a cheerful and professional service. 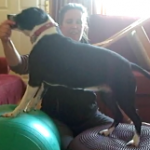 Here is a video of some of the physio exercises Tilly received. These are from about 9 weeks post op – so she has some easier ones first. Santa was limping on her front leg and the vet suggested physiotherapy treatment. Santa has an existing movement difficulty w ith her hind leg, she has a shortened gracilis muscle. So she moves a little differently and this over time puts some strain on her front legs and her back muscles. After a couple of physio sessions and a home exercise program, Santa is no longer lame on her front leg and is more comfortable in her back. She will have physio every couple of months to keep her so. Santa’s owner wrote ” It meant a lot to me that my dog was so calm and relaxed about the treatments and immedietly took to Nycky who was calm and relaxed herself. This really helped the outcome of the physiotherapy. 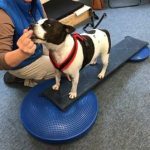 Each physiotherapy session had plenty of time allocated, not rushed and being treated at home was much better for my dog”. 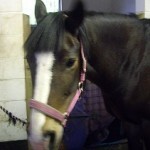 Twister is a pony who regularly competes at eventing and dressage. He receives a Physiotherapy MOT every 2 months to help his performance stay top notch. 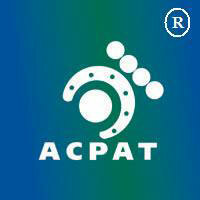 Regular physio MOT can help prevent injury by spotting subtle changes in the way a horse moves and correcting them. Twister’s rider says “We won our novice dressage test this past weekend with 74% out of 35 horses. After your treated him last week – he is moving brilliantly. Thank you so much” Jackie. 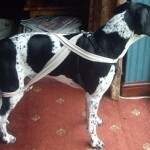 Dilly – elbow replacement post op physio. “My 9 year old kelpie/collie cross, Dilly, had end stage elbow dysplasia. Her leg had become so painful that she had stopped using it altogether and was no longer interested in going out of the house. Our local vet had tried a series of pain relief measures but even these had stopped working effectively. In the end we were looking at either an amputation or fusing the elbow straight. However, at the eleventh hour, we were steered towards a pioneering surgeon who is working on animal joint replacements. 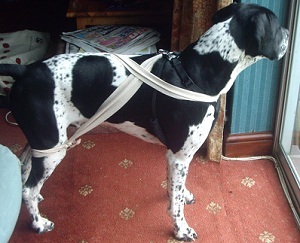 In June of last year Dilly had a total elbow replacement and the operation went very well. When we got her home there were two main challenges: to restore the muscles that she had lost through years of non-use and – perhaps the most difficult – to restore her confidence in the affected leg. Nycky came twice a week and achieved wonders ! She was always calm, caring and competent around Dilly which reassured her at a time when she was bewildered about her strange new limb. Nycky devised all sorts of interesting and fun exercises, each one to work on a different area. Not only was she highly professional in her approach, but she also made her visits exciting and enjoyable for Dilly. I believe this was important as it meant that she was always happy to cooperate and would greet Nycky’s arrival with wags of delight. Before Nycky left us she showed me exercises that I could do with Dilly and this gave me the confidence to take charge of her recovery myself. 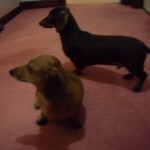 Below is a short video of some of the exercises Dilly did during her recovery. I wanted to know I was bringing my horse back into work properly after injury and a friend recommended Nycky for Physio rehab. She worked with us for 5 months addressing issues to help him work symmetrically, sorting out muscle tension and giving us correct exercises to help his recovering ligaments be used properly. The exercises formed part of our daily ridden work and in the stable. He is now back in full work and we are looking at the events calendar. I would recommend physiotherapy both as a recovery method but also to maintain fitness and suppleness for horses in work. My dog, who is very energetic, did some minor damage to his spine which meant he lost his co-ordination and balance in his back legs. The vet recommended physiotherapy with Nycky. 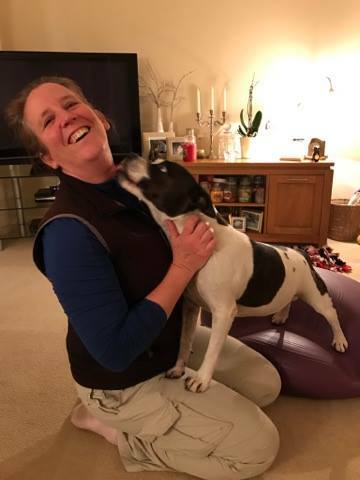 She visited Rossi at home regularly and did exercises to get him to use his back legs again properly and for his balance and core stability -like pilates for dogs! She gave us a home exercise program with written and pictured exercises. The whole family were able to take part in these exercises for Rossi’s recovery. At first I was worried he would not get better and felt deflated but Nycky explained he would get back to himself with physio rehab. He would not be doing as well as he is now without Nycky doing physio with us. Thank you for your support and clear instructions that have given me my Rossi back. Peter Pan is keeping very well at the moment – we seem to start cracking the nut of presenting ourselves supple and ‘on the bit’ in a more consistent manner. I had two dressage lessons in the last 3 weeks and we got a lot of praise I am convinced that Peter’s increased range of movement and the fact that he is starting to build up the ‘correct’ muscles has a lot to do with the work you’ve done with him/us over the last few months which we really appreciate! Bandit, a 14 yr Border Collie, had hyperextension at both his carpii – meaning the wrist joints on his front legs bent back instead of being straight up. This gets worse over time as the ligaments at the back of the joint stretch. In order to slow down the deterioration and to reduce discomfort, I made splints to support the joint into a more normal position. 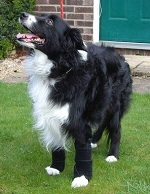 Having support of these joints means he can go for longer walks.